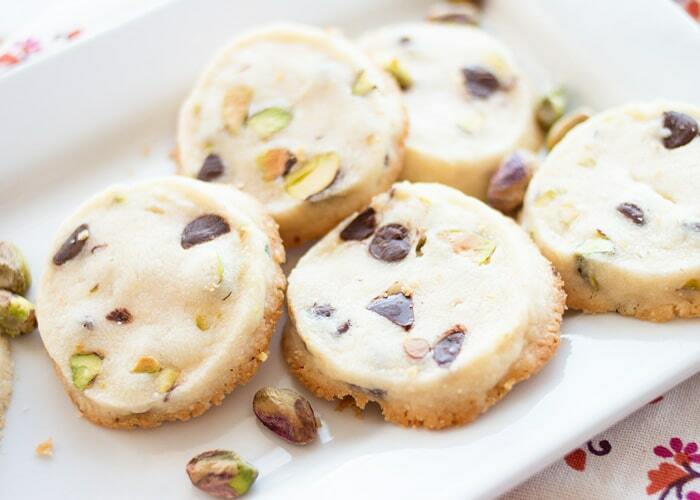 These lemon pistachio shortbread cookies are going to change the way you make cookies forever! Well, I did until now. I saw a recipe for Dark Chocolate Cranberry Shortbread Cookies and I immediately knew I had to try them. The result? 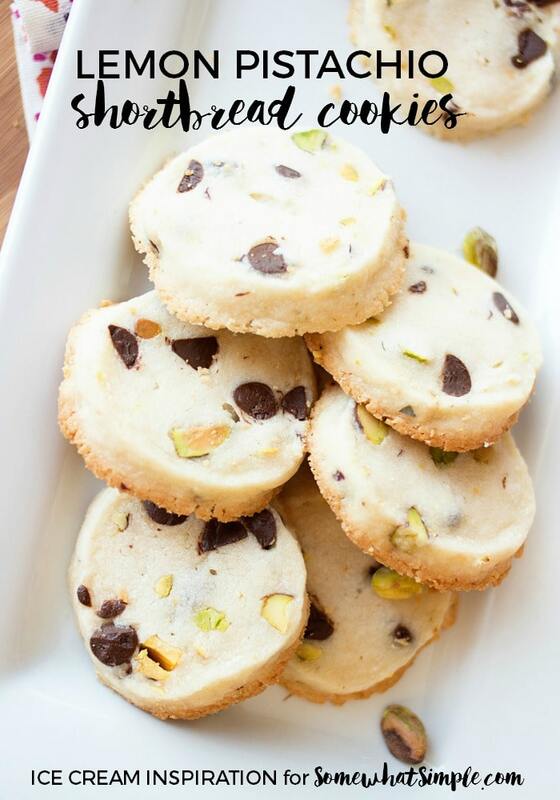 I fell head-over-heels in love with shortbread cookies and I began to realize how many variations I could make of these cookies. 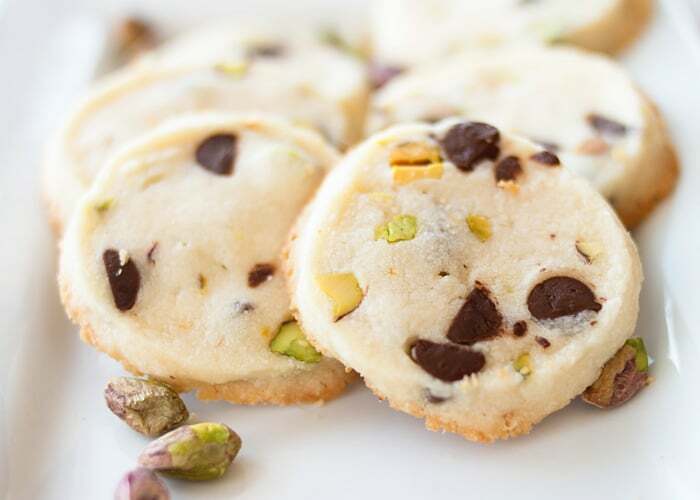 The thing that takes the most time with these cookies is freezing the dough. However, this is also a good thing, because you can make the dough days in advance, put it in the freezer, and then take it out when you want to bake the cookies so they will be nice and fresh. 2 tsp. lemon juice (You can add a drop or two of lemon essential oil if you really want to kick up the flavor. Just make sure that your essential oil is safe for internal use). Beat the butter for about two minutes in a large bowl. Butter should be pale and creamy. Add the lemon juice and beat another second or two until it is mixed in. Remove the bowl from your mixer (or take your beaters out of the bowl). Sift in the powdered sugar and gently stir with a wooden spoon. Sift in the flour and stir gently. Add the chopped pistachios and chocolate chips (if desired) and stir until combined. Put an 18″ (approximately) sheet of plastic wrap on the counter. (You can keep the wrap from moving around by wiping the counter with a slightly damp cloth beforehand). Put your dough onto the wrap and form into a long “log” about two inches thick. Press log tightly together so it does not come apart. Roll the dough up in the plastic wrap and put in the freezer until ready to bake. To bake, remove the log from the freezer and allow to thaw for about 15 minutes. Unwrap and slice into 1/2″ thick slices. (You may need to wait a bit longer for the log to thaw before you can cut into it. I use a large butcher knife to cut the cookie dough). Place on a baking sheet with a baking mat, or on a stoneware pan. Bake at 320 degrees for 16-18 minutes (longer if you use stoneware).